My household has had a demo unit of Dash for about a week and I don’t have anything negative to say other than I have to give it back at the end of the month. Woe is me, right? 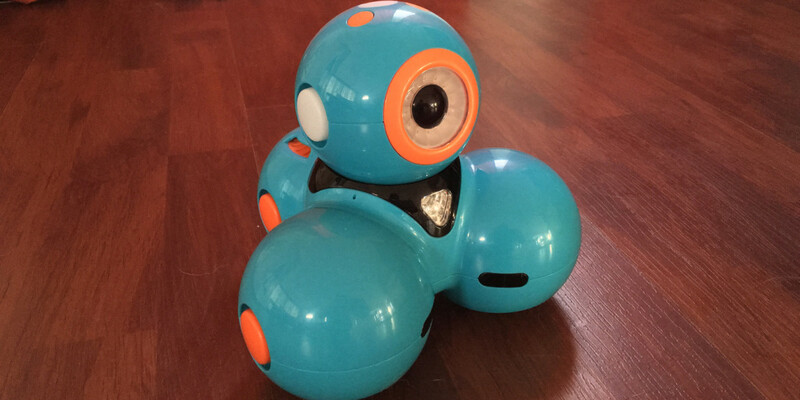 Dash is a one-eyed, three-wheeled, robot toy that is oozing with personality and designed to help kids learn how to program, all while playing games, singing songs, or just chasing the dogs around the living room. This little mini-review was supposed to include Dash and the still fun, but less capable Dot, but a shipping snafu saw Wonder Workshop send us two Dash units instead. No bother, Dash was a lot of fun all by himself. Right away, my family started to refer to Dash as a “he,” rather than “it” or “that thing that keeps freaking out the dogs.” This was an interesting choice by Wonder Workshop. Both Dash and Dot have gender-neutral names, so your child can choose their gender. Smart! Dash is chock-full of personality and watching him dance, say hello to everyone in the room, or quietly sing the input/output song makes you realize just how much thought went into creating him. As fun as Dash is, he’s equally educational. Dash comes out of the box with a few pre-programmed actions, but gets even more interesting as you begin to complete the coding challenges laid out in the mobile (iOS or Android) apps. Using these apps, and a series of increasingly difficult challenges you can program Dash to do just about anything. And don’t let the coding scare you. The drag-and-drop interface is simple, the tutorials are easy to follow and it felt more like a puzzle than writing code. Once you run out of challenges, you can program your own. Or, maybe you’d prefer to use your touchscreen device to drive him around like an RC car while he moo’s, sings, or burps at anything in his path, that’s okay too. If you want to pick one up for the holiday season, Dash is $149 and Dot is $49 at the Wonder Workshop website (below).